Because of the dominance of that giant red inverted sandstone horseshoe, some visitors to Arches National Park miss the Devil’s Garden trail–a section of the park that offers much more scenic hiking and a plethora of unique arches. Invariably those who can only spend a day want to hike to the arch that is on Utah license plates. And at the end of the trail the view is unquestionably awe inspiring. Only when standing next to Delicate Arch do visitors realize that no photo they’ve ever seen captures the magnificence of this natural wonder – not to mention the massive sandstone basin that most people never knew existed sitting beside the arch. But for all the glory of this famous arch, the trail that one takes to get there is fairly blah. It is like a bowl of vanilla ice cream with a single large chocolate covered almond. In contrast, Devil’s Garden Trail in Arches National Park is like a bowl containing a scoop of Rocky Road, a scoop of raspberry cheesecake and a scoop of caramel praline pecan with whipped cream and a cherry. Devil’s Garden Trail is the longest in the park and probably the most challenging for hikers. The exact length is tough to quantify because there are multiple routes and side trails along the way. The National Park Service website nps.gov calls it 7.2 miles. Along the route hikers can view eight named arches, including Landscape Arch, which at just under 300 feet is generally considered the longest natural arch in the world. There are also a few small unidentified arches visible on the hike. On the vanilla Delicate Arch trail hikers trek across sand and slickrock. Hiking the Devil’s Garden trail is like exploring an alien planet. The hike begins amidst massive sandstone fins and just beyond those red rock liths is a short side trail with views of Pine Tree Arch and Tunnel Arch. There is a wide range of desert vegetation along with shaded areas and breathtaking summits. 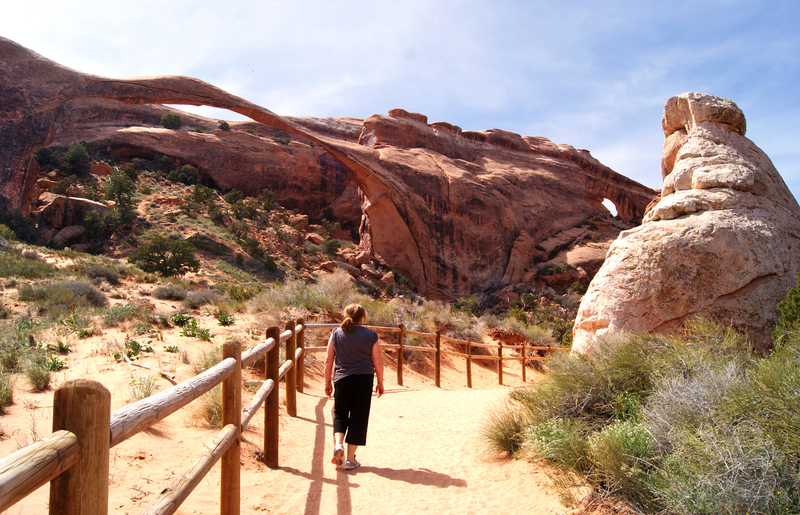 Back on the main trail, the hike to Landscape Arch is easy on a wide, manicured gravel pathway. It’s the section of trail after this arch that makes the hike unique. The graded walkway ends at Landscape and the trail beyond twists, climbs and drops through unimaginable red rock vistas. At the end is the other major arch on this hike: Double O Arch. There can be some confusion because another arch called Double Arch is an easy walk from the road on a turnoff just after Balanced Rock. The route to Double O Arch on the Devil’s Garden Trail is much longer and more difficult and the reward is greater. Double O is an arch above an arch. A surreal, other-worldly environment encompasses Double O Arch. Red rock fins, jumbled boulders, slickrock and desert vegetation surround Double O Arch on every side. 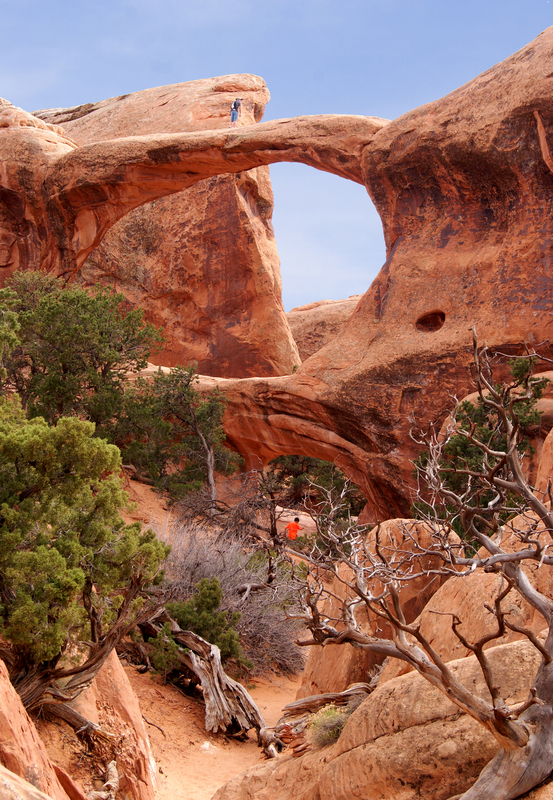 Hikers can choose the regular route to and from Double O Arch or they can opt for the primitive loop, which is a longer and more challenging route. According to gjhikes.com, “The Devil’s Garden Primitive Loop trail in Arches National Park is a world class hiking experience that provides a unique variety of arches and natural rock formations.” The site rates the trail as “strenuous” and lists an elevation gain of 1,652 feet. The hike requires scrambling up and down some slickrock, but I have personal knowledge of an older, overweight gentleman with an artificial knee who recently completed the jaunt without much difficulty. April, May and early June are great times to enjoy this hike before the summer heat really kicks in. As with all desert hikes, trekkers should dress appropriately and carry plenty of water—two liters per person is probably the bare minimum. For outdoor enthusiasts whose hiking experience at Arches National Park is limited to the Delicate Arch trail, the Devil’s Garden trail should be next on the list of adventures to try. 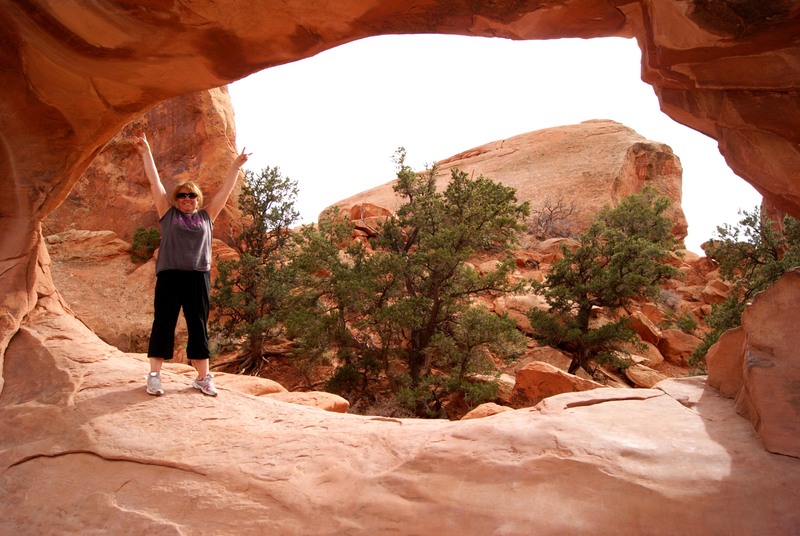 This entry was posted in Uncategorized and tagged Arches National Park, Delicate Arch, Devil's Garden Trail, Double O Arch, hiking in Arches, Landscape Arch, Utah hiking. Bookmark the permalink.